This 135lb Steel Co2 Tank with Siphon Tube is perfect for use with large scale productions and Co2 Effects System requiring a large quantity of Co2. This tank is better suited for situations where constant moving is not required. This tank does include a siphon tube (also called a Dip Tube or Eductor Tube). For liquid use, such as with CryoFX Co2 Jets, you do not have to turn it upside down. This 135lb tank has a limit of roughly 3 minute 45 seconds of liquid Co2 supply. This Short 100lb Steel Co2 Tank without Siphon Tube is perfect for use with Stage Co2 Cannons and Night Club Cannon Co2 Systems. This tank is better suited for situations where constant moving is not required. This tank does not include a siphon tube (also called a Dip Tube or Eductor Tube). For liquid use, such as with CryoFX Co2 Jets, you do not have to turn it upside down. 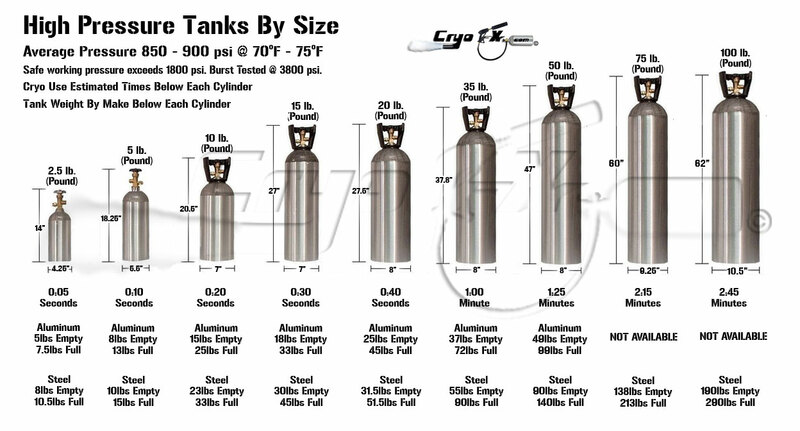 This 100lb tank has a limit of roughly 2 minute 45 seconds of liquid Co2 supply. 100lb Steel Co2 Tank, without a Siphon Tube. The 100lb Co2 Tank without a Siphon Tube can be used for any application requiring Co2 within North / South America and Canada. More specifically, any region which uses a CGA320 style Co2 Valve. This size tank is the largest non-specialty style tank for nightclubs, productions, festivals and any other type of application requiring large quantities of Co2 with the least amount of Co2 Tanks. This steel style Co2 tank will last for years to come as others in use currently have been used since 1960s. This tank does include a siphon tube, therefore when used in its upright position, it will disperse Co2 in it's Liquid form. This Short 100lb Steel Co2 Tank with Siphon Tube is perfect for use with Stage Co2 Cannons and Night Club Cannon Co2 Systems. This tank is better suited for situations where constant moving is not required. This tank does include a siphon tube (also called a Dip Tube or Eductor Tube). For liquid use, such as with CryoFX Co2 Jets, you do not have to turn it upside down. This 100lb tank has a limit of roughly 2 minute 45 seconds of liquid Co2 supply. Short 100lb Steel Co2 Tank, with Siphon Tube. The short 100lb Co2 Tank with Siphon Tube can be used for any application requiring Co2 within North / South America and Canada. More specifically, any region which uses a CGA320 style Co2 Valve. This size tank is the largest non-specialty style tank for nightclubs, productions, festivals and any other type of application requiring large quantities of Co2 with the least amount of Co2 Tanks. This steel style Co2 tank will last for years to come as others in use currently have been used since 1960s. This short tank does include a siphon tube, therefore when used in its upright position, it will disperse Co2 in it's Liquid form. This 100lb Steel Co2 Tank without Siphon Tube is perfect for use with Stage Co2 Cannons and Night Club Cannon Co2 Systems. This tank is better suited for situations where constant moving is not required. This tank does not include a siphon tube (also called a Dip Tube or Eductor Tube). For liquid use, such as with CryoFX Co2 Jets, you do not have to turn it upside down. This 100lb tank has a limit of roughly 2 minute 45 seconds of liquid Co2 supply. This 75lb Steel Co2 Tank with Siphon Tube is perfect for use with Stage Co2 Cannons and Night Club Cannon Co2 Systems. Weighing roughly 213lbs full, this tank is better suited for situations where constant moving is not required. This tank does include a siphon tube (also called a Dip Tube or Eductor Tube). For liquid use, such as with CryoFX Co2 Jets, you do not have to turn it upside down. This 75lb tank has a limit of roughly 2 minute 15 seconds of liquid Co2 supply. This 50lb Aluminum Co2 Tank with Siphon Tube is perfect for use with Co2 Cannons and Handheld Cryo Guns. Weighing roughly 99lbs full, this tank is still easy to move when a dolly is not present. This tank does include a siphon tube (also called a Dip Tube or Eductor Tube). For liquid use, such as with CryoFX Co2 Jets, you do not have to turn it upside down. This 50lb tank has a limit of roughly 1 minute 25 seconds of liquid Co2 supply. 50lb Aluminum Co2 Tank, with Siphon Tube. The 50lb Co2 Tank with Siphon Tube can be used for any application requiring Co2 within North / South America and Canada. More specifically, any region which uses a CGA320 style Co2 Valve. This size tank is the standard for nightclubs, productions, and more, and is the most common of tanks chosen before moving to oversized options. What is uncomon is the material makeup, as normally 50lb Co2 cylinders come in Steel weighing outrageous amounts empty and full. Empty this Aluminum 50lb Co2 Tank weighs roughly 49lbs and full, right around 99lbs. This tank does include a siphon tube, therefore when used in its upright position, it will disperse Co2 in it's Liquid form. This Short 50lb Steel Co2 Tank with Siphon Tube is perfect for use with Co2 Cannons and Handheld Cryo Guns. Weighing roughly 99lbs full, this tank is still easy to move when a dolly is not present. This tank does include a siphon tube (also called a Dip Tube or Eductor Tube). For liquid use, such as with CryoFX Co2 Jets, you do not have to turn it upside down. This 50lb tank has a limit of roughly 1 minute 25 seconds of liquid Co2 supply. 50lb Steel Co2 Tank, with Siphon Tube. The 50lb Co2 Tank with Siphon Tube can be used for any application requiring Co2 within North / South America and Canada. More specifically, any region which uses a CGA320 style Co2 Valve. This size tank is the standard for nightclubs, productions, and more, and is the most common of tanks chosen before moving to oversized options. What is uncomon is the material makeup, as normally 50lb Co2 cylinders come in Steel weighing outrageous amounts empty and full. Empty this Steel 50lb Co2 Tank weighs roughly 49lbs and full, right around 99lbs. This tank does include a siphon tube, therefore when used in its upright position, it will disperse Co2 in it's Liquid form. When used in conjunction with CryoFX co2 swing jet or Cryo Gun, it will disperse liquid co2 as needed for this style of Co2 Jets to work. This tank is made from Steel and is hydro tested before sale, which is required to get filled by any Co2 Gas facility that fills Co2 Tanks. This 50lb Steel Co2 Tank without a Siphon Tube is perfect for use with Co2 Cannons and Handheld Cryo Guns. Weighing roughly 99lbs full, this tank is still easy to move when a dolly is not present. This tank does include a siphon tube (also called a Dip Tube or Eductor Tube). For liquid use, such as with CryoFX Co2 Jets, you do not have to turn it upside down. This 50lb tank has a limit of roughly 1 minute 25 seconds of liquid Co2 supply. 50lb Steel Co2 Tank, without a Siphon Tube. The 50lb Co2 Tank without Siphon Tube can be used for any application requiring Co2 within North / South America and Canada. More specifically, any region which uses a CGA320 style Co2 Valve. This size tank is the standard for nightclubs, productions, and more, and is the most common of tanks chosen before moving to oversized options. What is uncomon is the material makeup, as normally 50lb Co2 cylinders come in Steel weighing outrageous amounts empty and full. Empty this Steel 50lb Co2 Tank weighs roughly 49lbs and full, right around 99lbs. This tank does include a siphon tube, therefore when used in its upright position, it will disperse Co2 in it's Liquid form. This 35lb Aluminum Co2 Tank with Siphon Tube is perfect for small productions and easy transport. Weighing roughly 69lbs full, this tank is still easy to move when a dolly is not present. This tank does include a siphon tube (also called a Dip Tube or Eductor Tube). For liquid use, such as with CryoFX Co2 Jets, you do not have to turn it upside down. This 35lb tank has a limit of roughly 1:00 minute of liquid Co2 supply. 35lb Aluminum Co2 Tank, with Siphon Tube. The 35lb Co2 Tank with Siphon Tube can be used for any application requiring Co2 within North / South America and Canada. More specifically, any region which uses a CGA320 style Co2 Valve. This size tank is perfect for applications where maneuverability is key. Small enough to fit into a personal car and move around easily without a dolly and large enough to hold 1 minute of co2 use, which for most DJs and small performances, is adequate. This tank does include a siphon tube, therefore when used in its upright position, it will disperse Co2 in it's Liquid form. When used in conjunction with CryoFX co2 cannon or Led Co2 Jet, it will disperse liquid co2 as needed for these style of Co2 Jets to work. This tank is made from Aluminum and is hydro tested before sale, which is required to get filled by any Co2 Gas facility that fills Co2 Tanks. 20lb Aluminum Co2 Tank with Siphon Tube, which is required for all Co2 Jets. This tank does include a siphon tube (also called a Dip Tube or Eductor Tube). For liquid use, such as with CryoFX Co2 Jets, you do not have to turn it upside down. This 20lb tank has a limit of roughly 40 seconds of liquid Co2 supply. 20lb Aluminum Co2 Tank, with Siphon Tube. The 20lb Co2 Tank with Siphon Tube can be used for any application requiring Co2 within North / South America and Canada. More specifically, any region which uses a CGA320 style Co2 Valve. This tank does include a siphon tube, therefore when used in its upright position, it will disperse Co2 in it's Liquid form. When used in conjunction with CryoFX co2 cannon or Led Co2 Jet, it will disperse liquid as needed for these style of Co2 Jets to work. This tank is made from Aluminum and is hydro tested before sale, which is required to get filled by any Co2 Gas facility that fills Co2 Tanks.